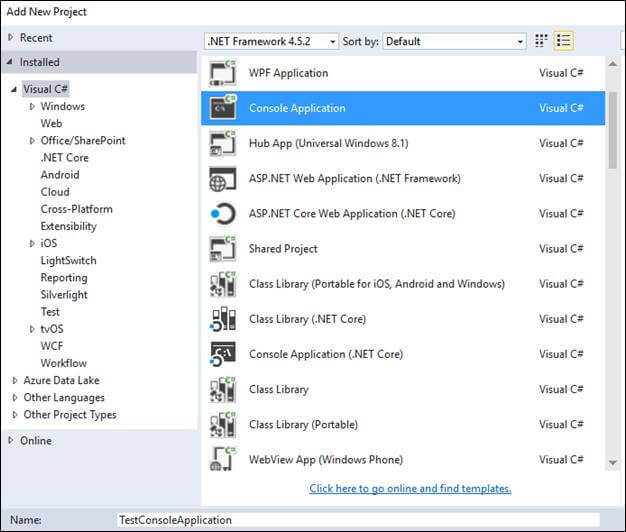 Note: For my all articles on C#.Net / Visual Studio, please visit here. Why & when should a method be marked as obsolete? 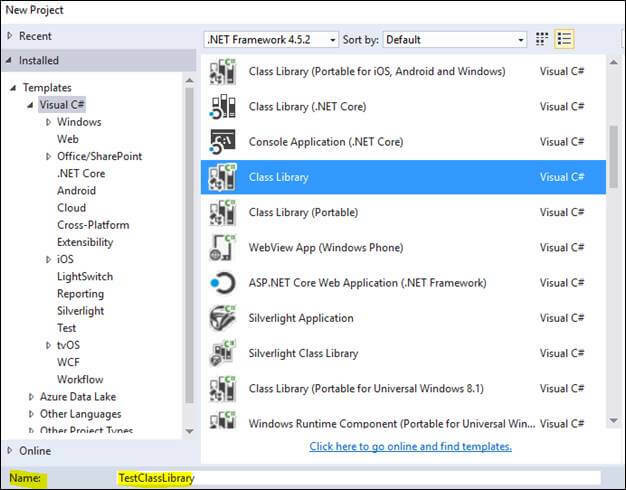 A method in a class library which is old or out-of-use and some other method instead of this is suggested to be used. Generally, when you are introducing some new functionality in your class library but still want to keep an old method intact for some time until the next big release then it’s better to mark that old method as “Obsolete” and offer new functionality in a new method. 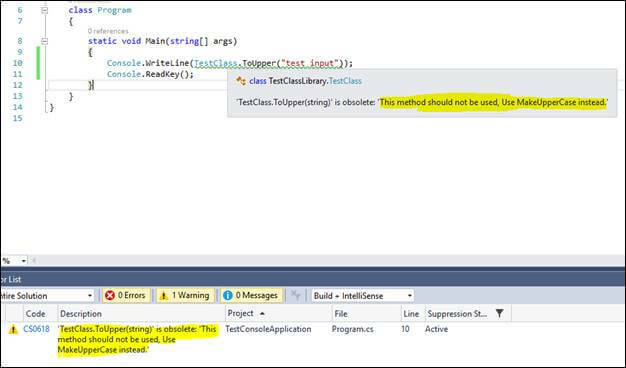 You are introducing some changes in your class library, and replacing a method with a new one with some added features, at that time it is a good idea to not suddenly remove that method from your class library because it may break some code. But if you mark that method as obsolete then it is an indication that this method is already out-of-use and something else should be used in its place. Let’s now see what options are available in C# to mark a method as obsolete. Now right click on solution and add a new console application project named “TestConsoleApplication”. Build the solution by pressing F6 and it should build fine without any error or warning. Now, let’s go to the TestClass and mark the ToUpper method as obsolete. For that just add “[Obsolete()]” attribute above the ToUpper method. What have we done here? We have marked the method with “Obsolete” attribute indicating its users that this method is now deprecated and will be removed in future release. So, it’s advisable not to use it. But this does not look like a good direction to the programmers on what to use if not this method. Let’s add one more method to class library. Go to TestClass.cs in class library project and add following method which has better error handling and its culture-neutral. We have marked the method with “Obsolete” attribute and added a message to be shown to the user which can work as an indicator to use some other replacement method. Now this looks like a good direction to a programmer who is going to use your class library. 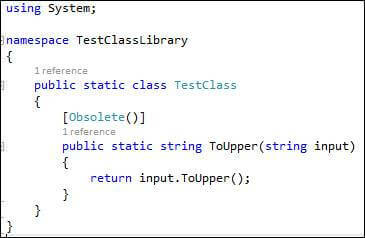 We have marked the method with “Obsolete” attribute and added a flag indicating compiler should raise an error if this method is used somewhere. Use this error flag in your class library when you want to introduce breaking changes in code. Note: This article was originally published by me on C# Corner website here.